Visible elements enables an administrator to “hide” specific fields in the database from the public (i.e., unauthorized users, or users who are not logged in). It also allows administrators to hide digital object metadata (such as file size, name, upload date, etc) for uploaded or linked content, and related Physical storage information. 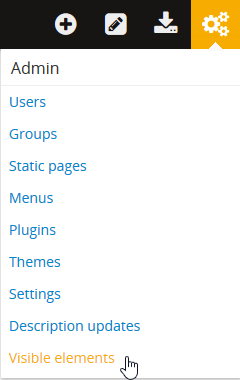 To access the visible elements menu, click on the Admin menu in the main menu located in the header bar and select “Visible elements” from the drop-down menu. 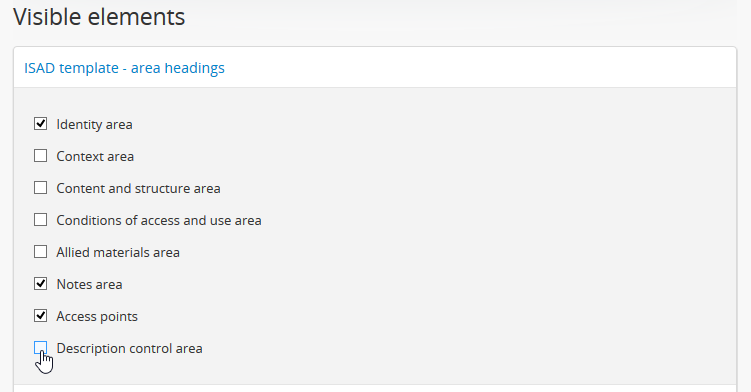 Each visible elements area will appear collapsed when the page first loads - click on one of the areas to expand it and view the available fields listed below. 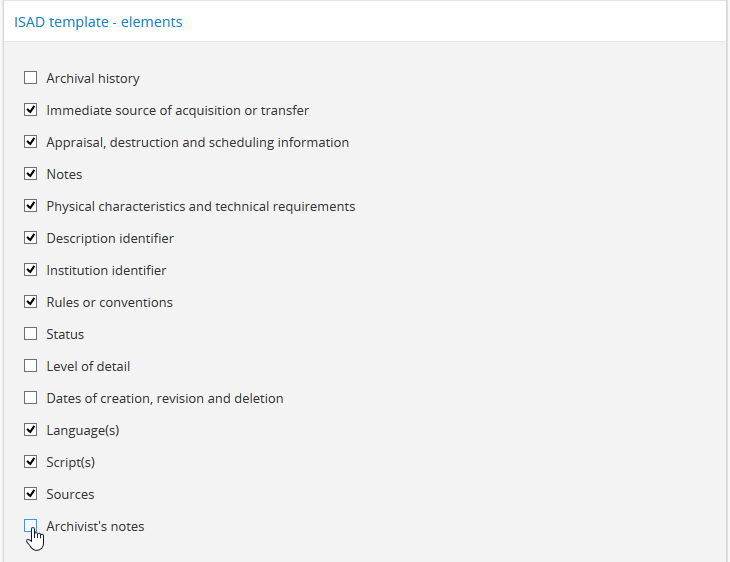 Each visible elements area includes a list of fields with check boxes next to them. When an element’s checkbox is checked, that element will be VISIBLE to public users. When it is unchecked, it will NOT be visible to public users (e.g. those not logged in). ALL authenticated users, from contributers to adminstrators, will be able to see those elements hidden from the public via the hidden elements module. If you are logged in, the Visible Elements module is not in operation. AtoM archival description data entry templates are based on international and national content standards for description - more information on the standards currently supported in AtoM can be found here: Descriptive standards. Most content standards are organized into sections or areas. In AtoM, these are expressed in the view and edit pages as information areas. Information areas appear on view pages and edit pages of any standards-based description template in AtoM, and group related fields based on the organization of elements of description in ICA (or other supported) descriptive standards. They are comprised of a number of fields in the body of the information area, and an area header, whose name is drawn from the related area or section of the standard upon which the descriptive template is based. 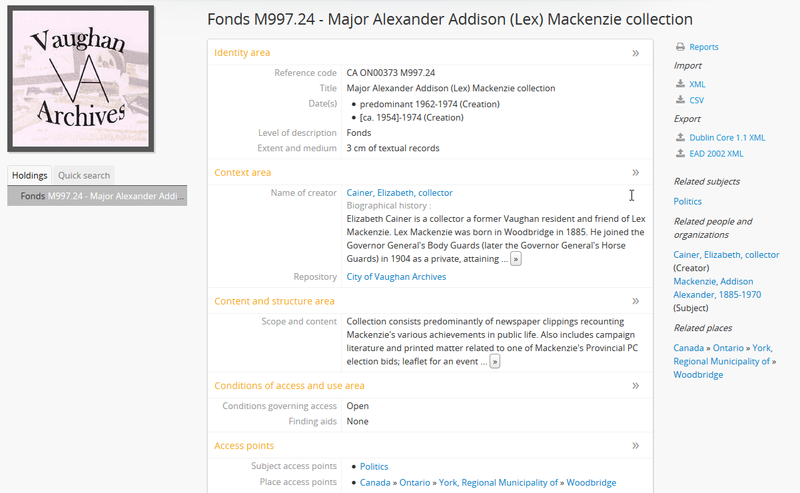 While these area headers are useful to archivists working with content standards for archival description, they may not be meaningful to public users. As of AtoM 2.1, an administrator can now hide the various area headers for the RAD and ISAD templates. To hide an area header from public view, simply uncheck the checkbox next to the header name. Remember to click “Save” in the button block at the bottom of the page when you are finished. 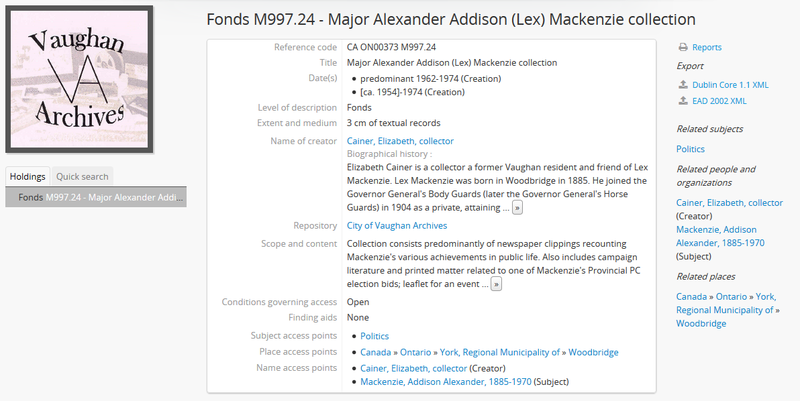 Within the ISAD and RAD templates for archival descriptions, specific fields can also be hidden from public users if desired. The names of each field available in the ISAD and RAD elements areas are taken directly from field names in AtoM’s data entry templates - which are themselves drawn directly from the related content standards. For specific information on each field, see: Data entry / templates. An authenticated (logged-in) administrator can check the checkboxes to reveal the field, while an unchecked box hides the field. To review which fields can be hidden from the public, select the ISAD template and /or the RAD template as applicable. Whether you hide/show elements from the ISAD or RAD area depends on which default template you are using. When you have made your changes, remember to click “Save” in the button block at the bottom of the page. Elements (e.g. 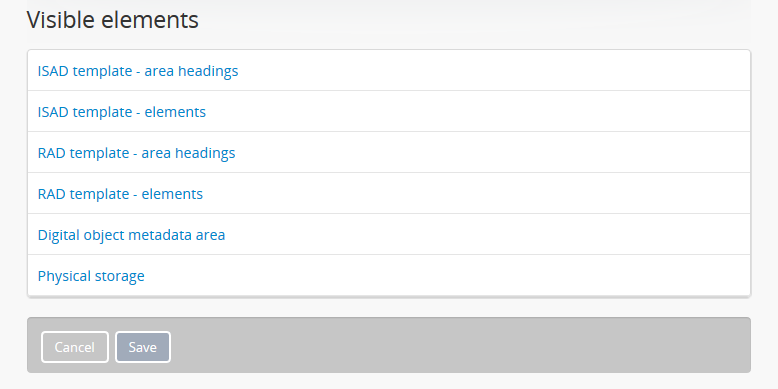 fields) that are hidden via the Visible elements module will not be visible to public users in the interface. However, the data will still be contained in the EAD XML download available to end users! Note that physical storage information, described below, is different - because location information can be a security concern for some users, when physical storage information is hidden via the Visible elements module, it is also removed from the EAD XML export for public users. An administrator can choose to hide some or all of these fields from unauthenticated (e.g. not logged in) users via the Visible elements module. In the Digital object metadata area, check a field to make it visible to public users, or uncheck it to hide the field from public users. For more information on uploading digital objects in AtoM, see: Upload and manage digital objects. Administrators can select whether Physical storage information is visible to unauthorized (not logged-in) users or not by clicking on Physical storage area, and checking or unchecking the Physical storage button.